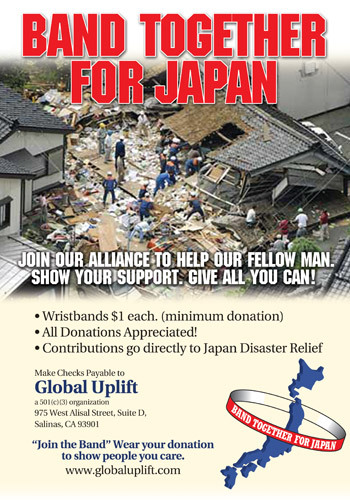 Global Uplift raised funds to aid the victims of the earthquake and tsunami in Japan. Because of the potential risks of radiation in the aftermath of the earthquake, tsunami and subsequent nuclear plant meltdown in Fukushima, Global Uplift raised funds for aid rather than send volunteers. Global Uplift collected donations in exchange for wrist bands that said "Disaster Relief" and also received spontaneous donations of over $2,000. Local Banks as well as Jamba Juices and various other businesses participated as collection points between April 20, 2011 and ending May 20, 2011. The Schoch Dairy was also a major participant. This fundraising effort was chaired by volunteer Doug Brown and succeeded in meeting its' goal of $10,000. Global Uplift is a 501(c)(3) organization and donations may be tax deductible. Global Uplift does not provide tax advice. Please consult your tax adviser to determine whether or not your donations may be tax deductible.